Well, it finally looks like springtime decided to make its debut...at least for now! 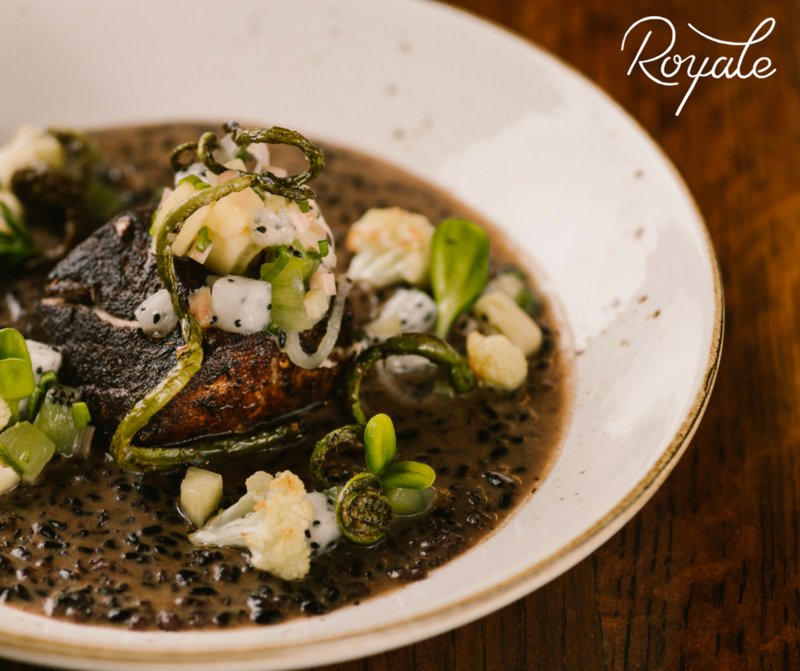 We’re jumping right into the heat of things and cooking up a storm with Oliver Royale’s newly released spring menu. For the spring menu this year, we decided to do a multi-cultural spin on barbeque themed items. Our idea was to bring out the up and coming seasonal fare of barbeque in multiple cultures. One of my new favorite dishes on the menu that embodies this idea is the Cast Iron Seared Jerk Swordfish. And we’re sharing the much-loved dish with our exclusive recipe! To get that perfect jerk flavor profile in the swordfish, we relied on Jamaican cultural flavors such as allspice, cinnamon, nutmeg, ginger, brown sugar, scotch bonnet peppers, as well as smoke flavors. The dish consists of a piece of sous vide jerk spiced swordfish, forbidden black rice steeped in coconut milk and tamarind, roasted fiddlehead ferns, a delicious salsa that consists of fresh hearts of palm, pineapple, kiwi, and rhubarb, and finally, a beautiful chutney made with bell peppers, rhubarb, and scotch bonnet peppers to really top it off. Try it out and let us know what you think! Or better yet - tag us on Instagram (@oliverroyale) with your finished dish! Cut 4 - 4 to 6 oz cubes or blocks of nicely cleaned swordfish. Use only the nice white meat; no bloodline or connective tissue. Season each piece thoroughly with a Jamaican jerk spice blend. Place in your sous vide bag and cook for approximately 1 hour or until meat has firmed by half. For the rice, cook approximately 3 cups of black rice in rice cooker per the cooker's instructions. For the coconut tamarind cream, combine 2 cups coconut milk and 1 cup tamarind puree, or 3 oz tamarind bean paste, in a blender. Process until combined. Add 2 tbsp sugar and 2 tsp salt. For the chutney, finely dice 1 of each red, green and yellow bell pepper, 2 stalks of rhubarb and 1 scotch bonnet pepper cut in half. Place all ingredients in a small saucepan with a cup of sugar and simmer over low heat stirring frequently and adding small amounts of water to avoid sticking and scorching. For the salsa, dice the palm heart small being sure to only use the soft sweet inner core. Dice the pineapple, kiwi, and rhubarb the same size as the palm heart. Combine all ingredients and toss together with a little sugar and coconut oil. If serving family style, put the rice in a sauté pan and add the coconut tamarind cream. Bring to a simmer on the stovetop or grill. Make sure to leave some of the liquid in the pan. While the rice is heating and coming together, grill the pieces of swordfish to the desired temperature - just a few minutes on either side should be perfect for a nice medium cook, depending on the thickness of cuts. Heat up a pan with olive oil on the stove top or on the grill. Once hot, place 3 to 5 fiddleheads per piece of fish in the hot oil. Season with salt and pepper and lightly sauté until slightly crisp. Pour rice and coconut cream onto a platter. There should still be some liquid! Place pieces of swordfish on the rice. Top each piece with a heaping spoon of salsa, place 3 to 5 fiddleheads on top of salsa, and a teaspoon of the chutney on the side of the fish so that it runs a bit into the rice below. This delicious dish is sure to embody the spirit of barbeque season and add a little something extra to any backyard get together!